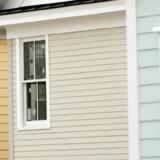 Energy efficiency: Stucco's continuous surface is less prone to energy loss than siding choices with many seams. Impact resistance: True stucco is less likely to suffer from hail storms and other impacts. Insect resistance: Stucco resists insect damage better than non-masonry sidings when contact with ground is avoided. Fire resistance: Stucco's cement base is naturally flameproof. Versatile appearance: Finishes range from smooth to heavily textured. Color can be mixed in or applied afterwards. Stucco installation is a very rigorous physical skill demanding excellent health, strength and stamina, Techniques and tools required are not as familiar to the average handyperson as those used for other sidings. Climate-appropriate substrata are crucial. Applying just the right amount of stucco over the chicken wire, finishing the bottom correctly for insect resistance, and getting a consistent texture are all skills that look easy when a pro does it. Now add factors like how tall your home is, how level the ground, your tolerance of ladders, removal of old siding and correction of underlying problems, and an expert's bid can begin to look very attractive. Even repairs to existing stucco can be quite obvious if not knowledgeably done. Check "Stucco" in your yellow pages to find local contractors, then check the Better Business Bureau and your Registrar of Contractors for reliable experts. Take that first step to greater curbside appeal for your home.